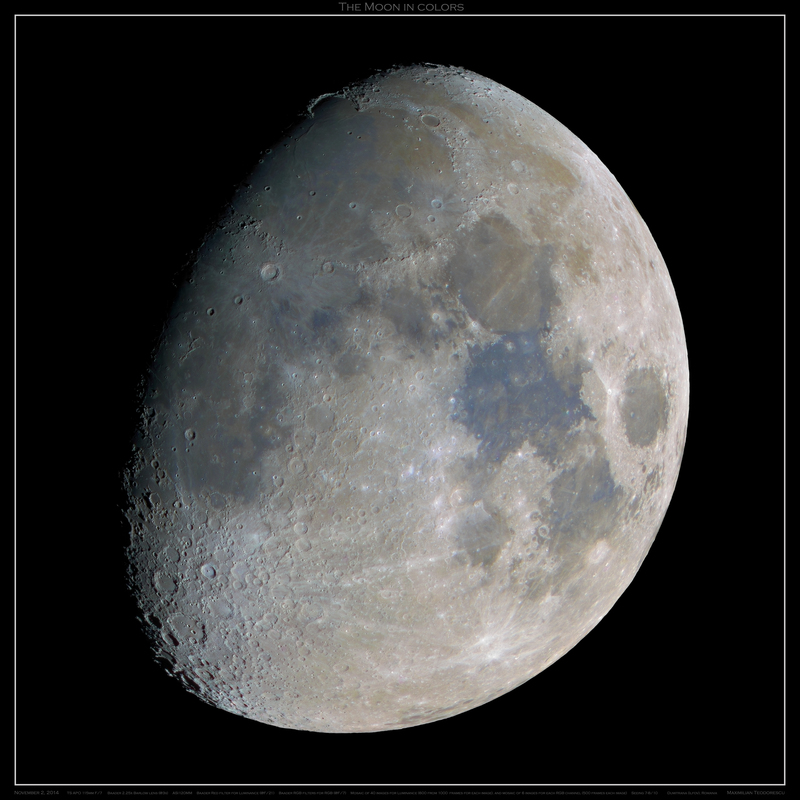 On November 16, Chuck Wood announced that the Lunar Photography of the Day website will come to an end on December 31. That is, he (Chuck, the one who has written almost all of the scientific comments of this wonderful site for “lunatics” like me) will not continue to select, post and comment images strongly or less strongly related to the Earth’s only natural satellite: the Moon. This is sad news for me, since in the last 10 years I have become dependent on this website, reading almost all of the daily posts each morning. My fascination with the Moon started 13-14 years ago, but at the time I had very little to read from or search in about the Moon besides some old books. LPOD introduced a new way of communication between amateur lunar imagers and lunar scientists (like Chuck Wood), namely very good or highly relevant images of lunar formations sent by amateurs were selected and afterwards commented in a scientific manner, with information about the geology, history or other observations. Some new discoveries were made in this way (new rimae, domes or other features, unseen before in Apollo images due to the different illumination or lack of images altogether), and the most important part for me (as an amateur astronomer) was that they were made from amateur images, not orbiting probes data or giant ground telescopes pictures. More recently, the LROC data had become available and finally we had an extremely high resolution map of the Moon via the Internet, which can be consulted at any time. But it wouldn’t be very usable (besides the resolution part) in bringing new information about the Moon if scientific comments like the ones on the LPOD site would not accompany those lunar images. So, what LPOD did change was the kind of information and the way it was received by those interested in the Moon. I must say that besides the actual information extracted from the images by Chuck, I was also highly interested about the images themselves, especially by those of some of the best lunar imagers in the World, like Damian Peach, Wes Higgins, Mike Wirths, Paolo Lazzarotti and others. It was here that I’ve started to grasp some of the knowledge of creating high resolution lunar images (and I’m still learning, being far from what the above-mentioned “professional-amateurs” have done). It was on LPOD that I had my very first image posted on an international website, on February 22, 2008. Since that date, Chuck Wood selected some of my images for 43 LPOD’s, which makes me quite proud for having a lunar scientist selecting and commenting my amateur images. Thank you Chuck for making my imaging effort worth something! Luckily the LPOD database will be held in place for some time (hopefully forever) so I and others like me (interested in lunar science) will have a website with interesting information about the Earth’s Moon. Again, thank you Chuck for the LPOD site! Another imaging session with the 4.5″ APO refractor under very good seeing conditions. This time I’ve played a bit with the filters to see which is better for lunar imaging. What I have “discovered” is presented below, but before that, I will begin with some basic grayscale images. The diversity of the results impose a chapter-like presentation, so this post will have it’s own three sections. Chapter I: Grayscale lunar images. The following are for sure my best images using the Teleskop Service 115mm F/7 apochromatic refractor. Not only that I had some luck with very good seeing conditions (8/10) but also because the experimental imaging session proved to me that using a distinct filter (the blue) reveals details smaller compared to my usual red-light imaging. The entire setup used for the first images: TS APO 115 F/7 Refractor, Baader Hyperion 2.25x Barlow lens (at 3x), ZWO ASI120MM camera, and Baader CCD blue filter. 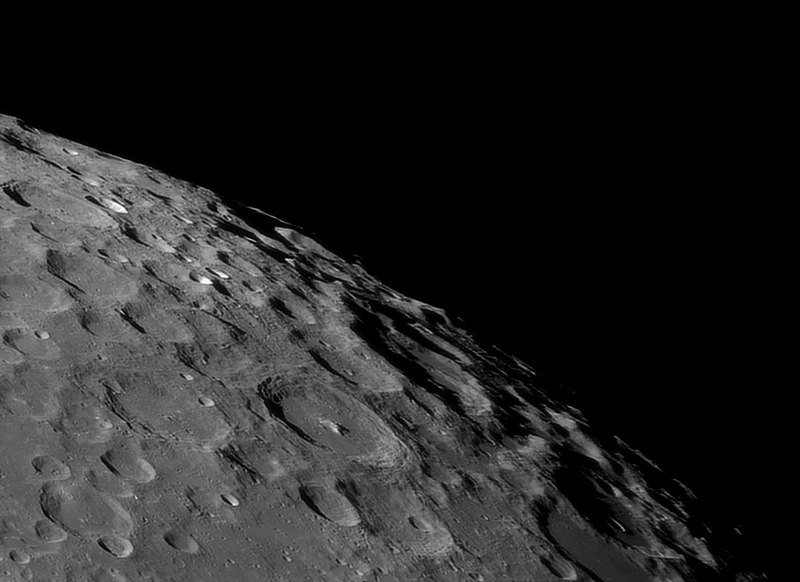 The lunar South Pole and crater Moretus. The image has some rather good resolution, being one of my best-looking images of this area. It can actually be compared with some other views acquired with my ex-scope, the Celestron C11 (280mm) under less favorable seeing conditions (4/10). 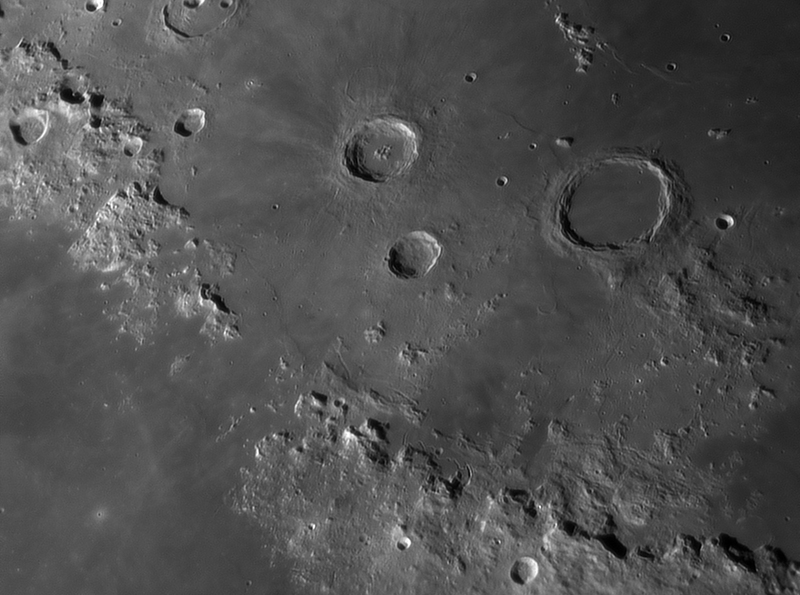 Mare Humorum with crater Gassendi. Another image comparable with some of my earlier C11-made views of this area. There are some small rimae visible in and around Gassendi. 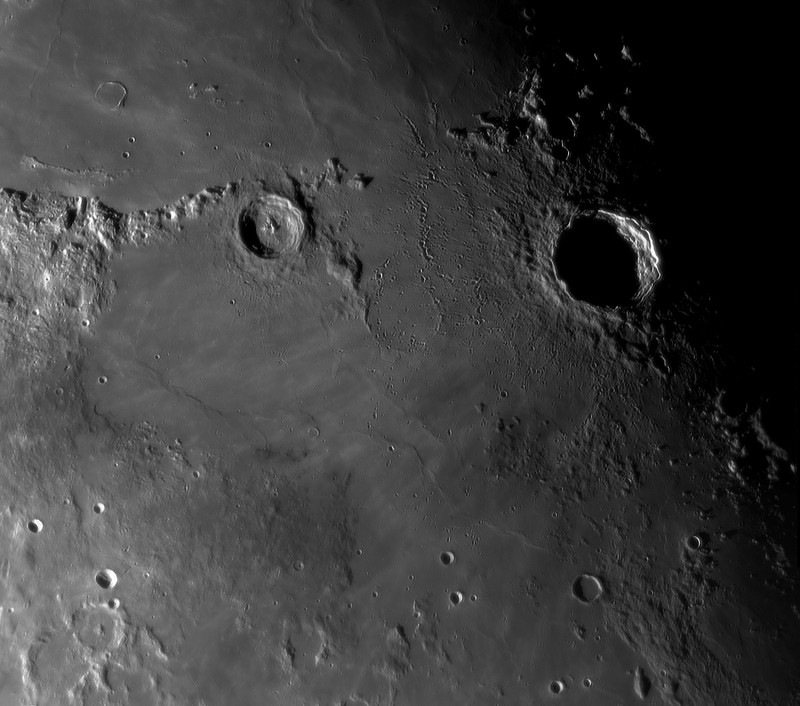 Sinus Iridum and Plato. This view shows crater Plato with some of the smaller craterlets on it’s floor, but also the detectable inner rima inside Vallis Alpes. Not bad for a 4.5″ instrument! Crater Bullialdus. 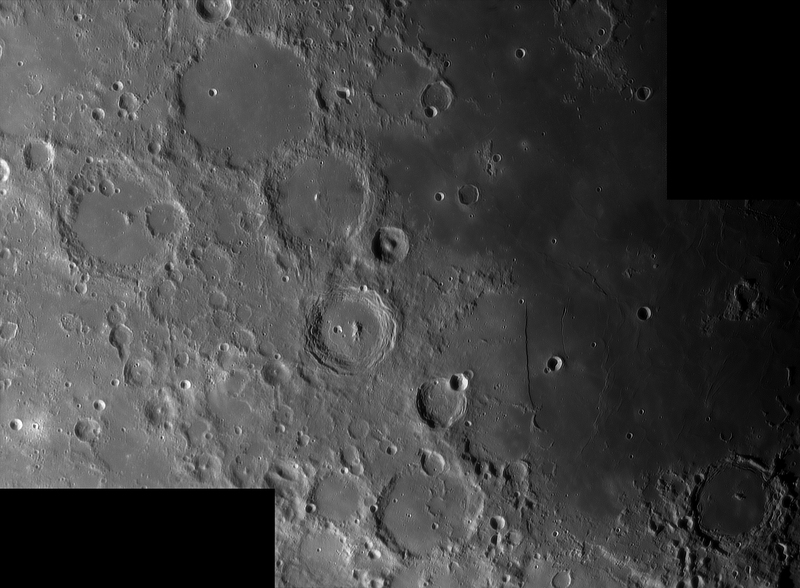 This image shows Bullialdus in the upper-right corner and a lot of rilles and other formations, like double-craters (lower-right, Hesiodus A crater). I was saying at the beginning of this post that I will comment a bit about something I’ve “discovered” for myself: choosing the blue filter for best details. Well, besides a brief link regarding angular resolution as a “fast-explanation” about how the smallest details in the visible spectrum are obtained in blue light, I can also comment a bit about my optical setup. There are actually a few reasons that allow smaller details to be obtained in blue light compared to green or red light. The first one is the degree of optical correction of the instrument’s objective lenses, in my case a refractor. Despite it’s name “APO” this does not mean that there are no chromatic aberrations or other optical defects in the system. There are, and maybe they are small but for high-resolution images of the Moon or planets, the smallest defects are always going to be visible in one way or the other. This could be one reason why the red images show blurry contours and none of the smallest details present in the green and blue images. Another reason might be the filters themselves. And I’m sure that this contributes to the blurry aspect of the red images. The Baader CCD Red filter allows for some infrared light to pass through, which means that a large domain of the visible-to-near-infrared spectrum gets to the CMOS sensor of the ASI120MM camera, which is actually fairly sensitive in the NIR (Near InfraRed). Of course, as many amateur astronomers know, the red-infrared domain is best for bad seeing conditions, the atmosphere being much more permeable to this part of the spectral domain, and thus allowing for some good images to be obtained despite not-perfect seeing conditions. But, as I’ve mentioned earlier (with a link), red light means a lower level of detail compared to blue light. So, the two choices, without speaking about the green which is in the middle, are: blue filter for very good seeing conditions, and red filter for less good seeing conditions. And now for the final results of this sessions. 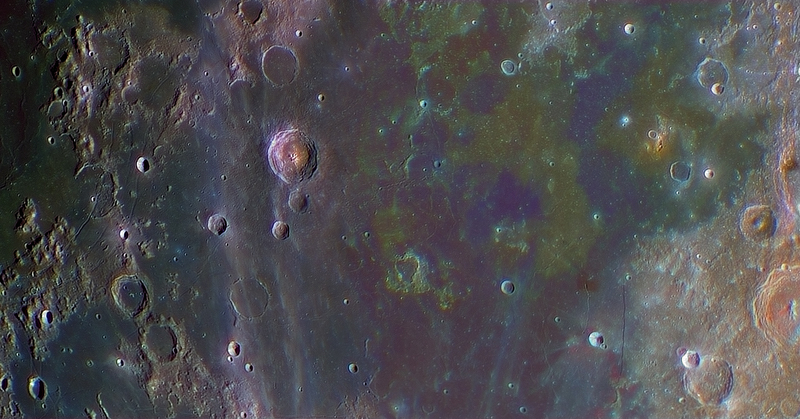 As I was saying earlier, I did manage to acquire some RGB data for some lunar regions. I’ve chose the LRGB method, which implies using one of the color channels as Luminance (in my case it was the blue channel due to better details obtained using the blue filter) and afterwards overlaying the RGB data onto it. The RGB data was highly-saturated to better show the color differences. The first image is of Copernicus. It shows a lot of colors depicting different materials being ejected from the impact onto the floor of the nearby mare. 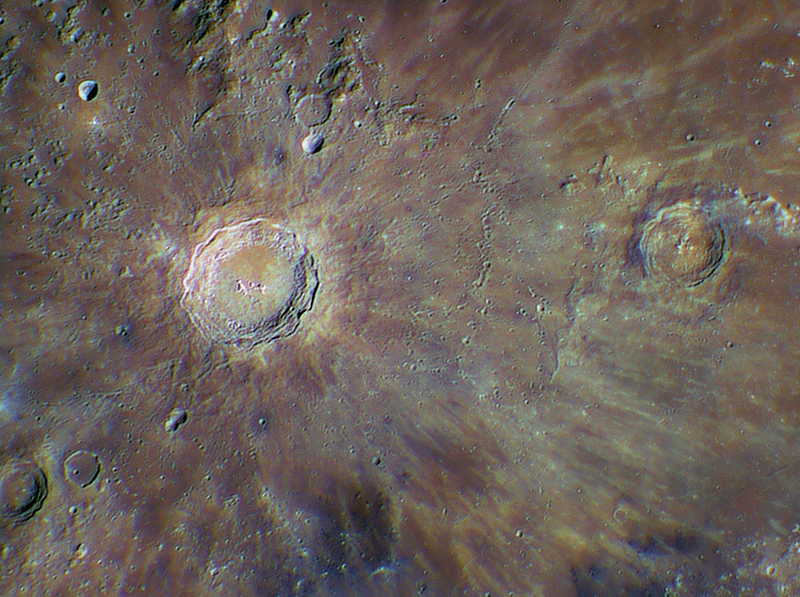 But since this session was all about experiments, I’ve over-saturated the colors a bit more (a lot more actually) and reprocess the image entirely, the result being a bit “eye-damaging” but presenting more information in terms of crater rays morphology. The second color data set is of the Bullialdus area. Again, a lot of interesting information can be extracted from the color data, such as the yellowish floor of Bullialdus being of a different material from the rest of the surrounding area, and blue rays from Tycho crossing close-by. Interesting is also the dark-brown patch at one end of Rima Birt, as are some reddish spots near and in crater Birt. I’m not an expert in lunar geology to be able to comment on all of this different colors and their associated features, but I can realize that there is a lot more information on this type of images (LRGB) compared to simple grayscale ones. UPDATE: The last two images were combined together by Chuck Wood and selected as the LPOD for November 15, 2014. I can only hope for some good seeing again soon, to capture and create some new LRGB lunar images with the refractor. Between the daytime job and the late afternoon “home improvements” (that is mounting windows and other stuff), plus the new 14″ Newtonian telescope ongoing modifications, I found some time to finally process one my best lunar mosaics acquired using the 115mm APO refractor. The frames that make the mosaic were acquired on the cold and foggy night of November 2, under very good seeing conditions. That night I’ve asked my wife to accompany me at an initially short observing run to test some RGB imaging with the refractor, but after the first acquired images I’ve realized that it would be a good moment for a large lunar mosaic. 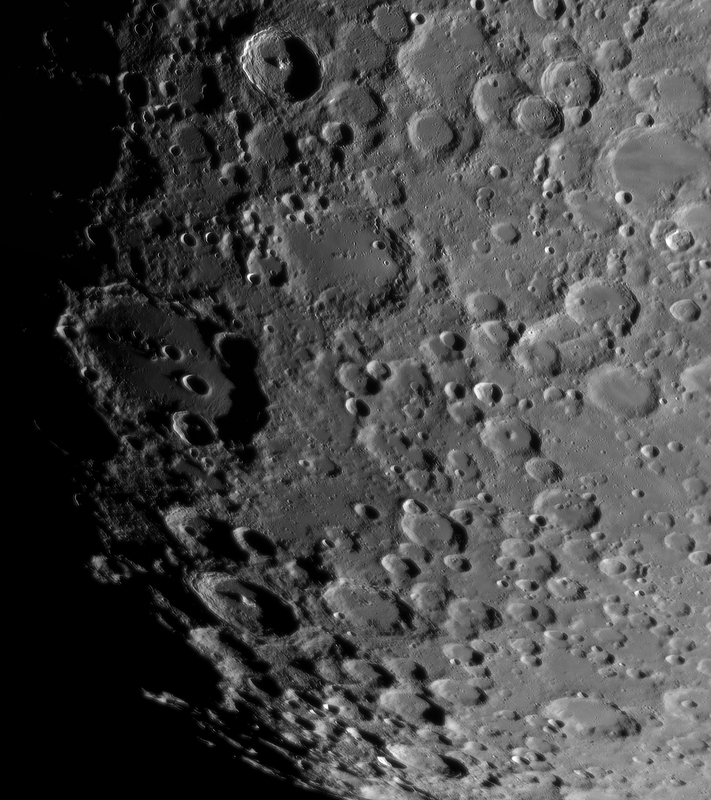 The following is a 40-image mosaic (resized to 80%), each a 600 out of 1000 frames stack. The seeing was around 7-8/10 so some of the smallest details detectable are close to the theoretical limit of the aperture used. Such details are: some small craterlets on the floor of Plato (not only the four larger ones! ), the rima inside Vallis Alpes (which is rather difficult actually) and some other small craters on the floor of Clavius. Also notice the multitude of domes near the terminator in the Copernicus area. 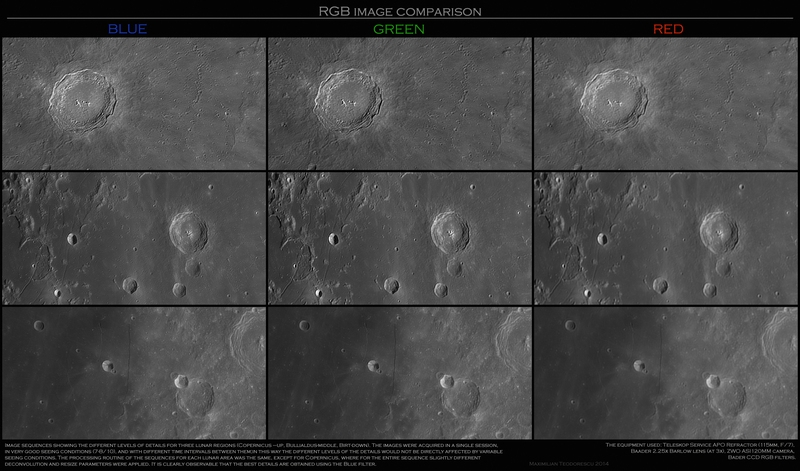 But, since I’ve wanted to test the RGB filter set on the Moon, I had to do some mosaics for each of the color channels. This time I’ve stacked around 500 frames for each of the 6 images that make out a single mosaic corresponding for each of the three color channels. The total processing time for the following image was around 10 hours, which included the stacking process, the processing of each of the images that make up the mosaics (both the “luminance” and RGB mosaics), processing the background (this actually takes a lot of patience), color saturation and overlaying of the colors onto the black-and-white larger image. It was a painstaking job but the end result looks good even by my standards (which are usually quite high in order to achieve better processing results). Of course there are some small retouches that I could have done, but this mosaic will not get any more attention from my part. I’ve just sold my C11 SCT…My long-time friend…the C11. And until my new larger scope will arrive (which will be subjected to large modifications to be handled by the NEQ6 mount) I’m using for my lunar images another, even longer-time friend, an 8″ F/5 Newtonian. Plus, I had the chance of buying a second-hand DMK21AU04.AS camera (mostly for my wife which I hope will eventually get the lunar-imaging virus). I’ve wanted (for some time) to compare this camera with the ASI120MM, both on the same scope, since one is almost double the price compared to the other, while the actual resolution is four times smaller. Also, the imaging sensors are quite different: one is a CCD while the other is a CMOS. Well, together with my wife and her brother, we went to my usual observing place and mounted the equipment before waiting for one hour for the mirrors of the 8″ scope to cool down. The equipment consisted of a (highly) modified 8″ F/5 Newtonian, a 2.25x Baader Barlow lens and the two cameras both filtered with the same Baader Red filter. The images bellow are stacks of 800 frames out of 2000, in variable seeing conditions, from 4/10 to 6/10. 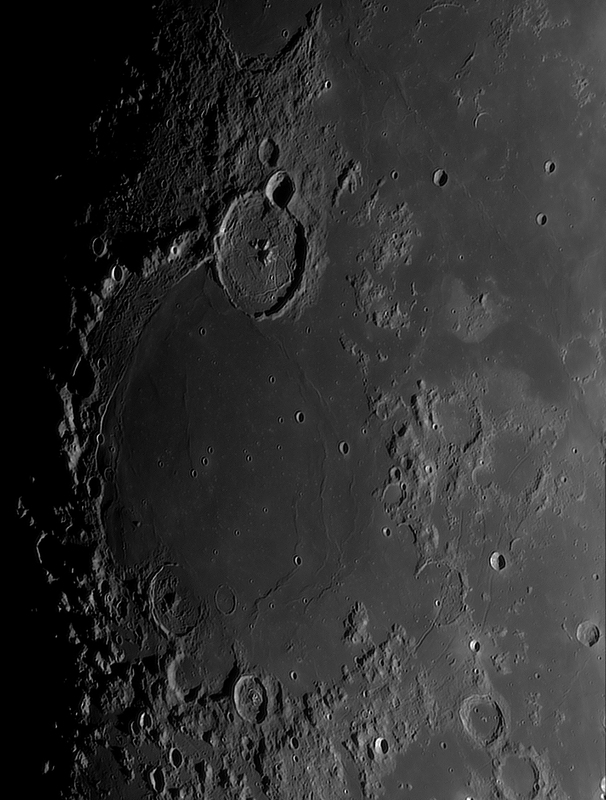 Before starting the actual comparison between the ASI and DMK cameras, I had some rather good seeing moments (despite the Moon being only 32 degrees above the horizon) and started a brief imaging session of some of the more “good-looking” lunar features. 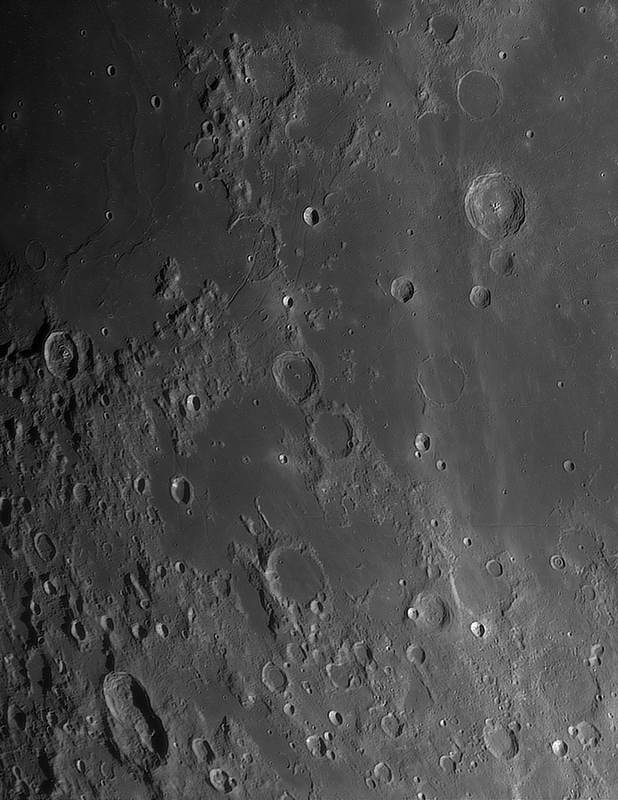 The first one: Rupes Recta and the trio of craters Alphonsus, Arzachel and Ptolemaeus. The image is the resulting work of two-people, myself doing the settings and processing while my brother-in-law correcting for the mount’s periodic error. Another comparison between the cameras, this time with the same resize factor (120%), showing crater Plato in two images acquired in a bit different seeing conditions: my image with the ASI was taken in 5-6/10 seeing, while my wife’s image was in some poorer seeing (3-4/10). Still, the images show the advantage of the smaller ASI pixel size, with the small four craters near the center of Plato being far better visible not only due to seeing but mostly due to the higher image scale. 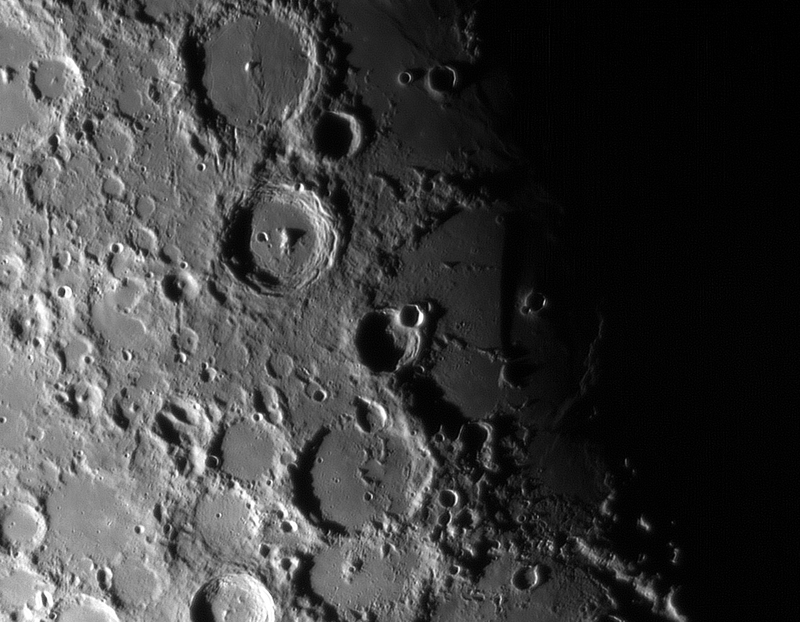 The seeing was again good for the following image, which shows Copernicus in shadows, imaged again with the ASI. My final conclusion of this brief test with the two cameras is that both perform more or less the same regarding the noise level and sensitivity at the same resolution (with the ASI working in ROI mode at 640×480 pixels to be comparable with the DMK), but the higher frame rate of the ASI is definitely an advantage. 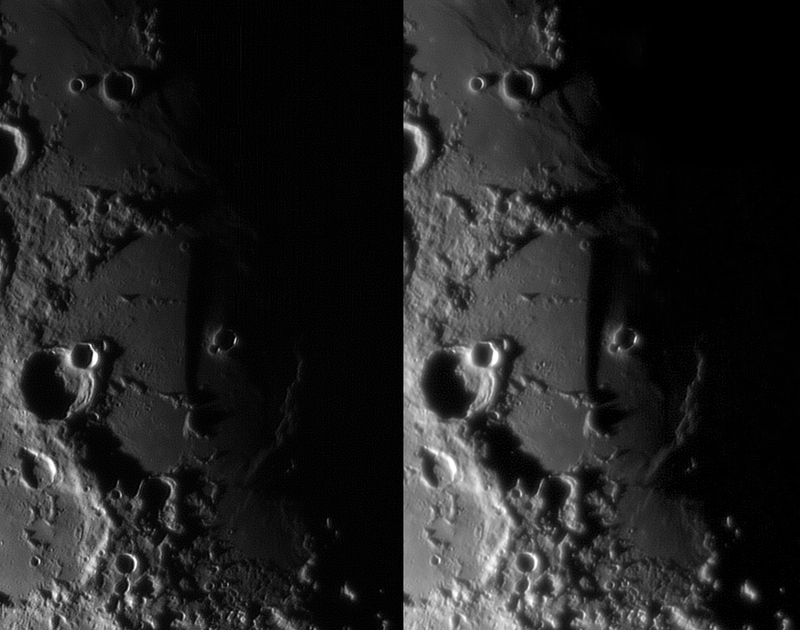 Of course, the settings for both cameras were kept equal in all comparison images, and the optical chain was the same, with the Baader 2.25x Barlow lens placed almost at the same distance form the sensors (an error of about 2 mm is still present, with the ASI being slightly closer to the Barlow lens). The advantages of the ASI are the lower price, the higher resolution, the higher frame rate at 640×480, and the smaller pixel size, which works as an invisible Barlow lens allowing at the same settings (compared to the DMK) a higher image scale without extra noise due to lower light (from higher amplification factors). But there are also some other issues which I’m still going to investigate further, like the data transfer from the CMOS sensor of the ASI compared to the CCD of the DMK. For fast moving targets (like the ISS onto the Sun’s surface in a transit event) the ASI fails to produce a “true” image, while the DMK doesn’t. I will instigate this in a future ISS pass. But, the results and conclusions place the ASI above the DMK (from my point of view), at least for lunar imaging and especially lunar mosaics. The DMK images are very much comparable with the ASI’s ones, but the lower image scale means that the smallest details will never be present in the final data. I am very glad I did buy the DMK, but only because it was at a second-hand price. After using the ASI for some time now, and considering it’s low price, I wouldn’t buy any other new cameras on the market today. On an apparently good evening for lunar imaging, with only some traces of fog at the horizon, I’ve decided to take my long-lived 8″ F/5 Newtonian telescope (now modified to be more easily transported and stored) out again for a very brief imaging session together with my brother-in-law. Unfortunately the fog rapidly grew and covered all the sky and ground, allowing me only a few minutes for setting up the equipment and to make the necessary adjustments like collimation and focusing. I’ve only got a very brief 10 minutes for actual imaging, and the most striking feature visible at the time was the shadow of Rupes Recta. The following image is a stack of only 1000 frames in 4-5/10 seeing conditions, acquired with the ASI120MM camera and a Baader Green filter mounted after a Baader 2.25x barlow lens.